According to the CDC, heart disease is the leading cause of death in the U.S. But shockingly, the World Health Organization says that 80 percent of heart disease is preventable. That’s right, 80 percent. The most common risk factors for heart disease are smoking, high cholesterol, high blood pressure, inactivity, obesity and diabetes. You can prevent heart disease by doing things like exercising, eating right and quitting smoking, but that’s for another article. There’s a story circulating in national news about a local woman who believed she was suffering symptoms of a viral illness. She wanted to sleep it off, but at the insistence of her husband, she went to the emergency room and discovered she was in the throes of a heart attack. These stories are common, so it’s important to listen to your body. If you don’t feel right, go in to the hospital and get checked out. If you do believe that you are suffering the symptoms of a heart attack call 911 immediately and, according to a suggestion by Harvard Medical School, chew a tablet of aspirin. By 2020, the American Heart Association wants to improve the cardiovascular health of Americans by 20 percent and reduce death from cardiovascular disease by 20 percent. The key to this goal is education. Let’s all work together to spread awareness of the preventable nature of heart disease and the subtle signs of a heart attack. This is a throw together, very easy kind of meal. I took a couple thawed chicken breasts and browned a little in the Ninja (stovetop high). I put in 2 cans of no-salt-added diced tomatoes with basil, oregano and garlic. Added about a cup of frozen mixed cut peppers and onions. Simmered for about 20 minutes on stovetop medium. We have belonged to a CSA (Consumer Supported Agriculture) Farm for 13 or so years. We originally joined Great Country Farms so our son could see what farm life is like. Our son has long left home but we still love the farm, now more than ever. They deliver each week during the growing season and we can go out there whenever to pick our own. Sometimes, we go just to walk around in the country air. By chance, I also found a winter CSA that I’ll join next fall and a buy-as-you-go farm that delivers each Thursday, if you want what they have on offer each week. I originally found East Side Produce through a half-off deal on Groupon. We got $40 worth of fruits and veggies for only $20 – including delivery. You can’t beat that! 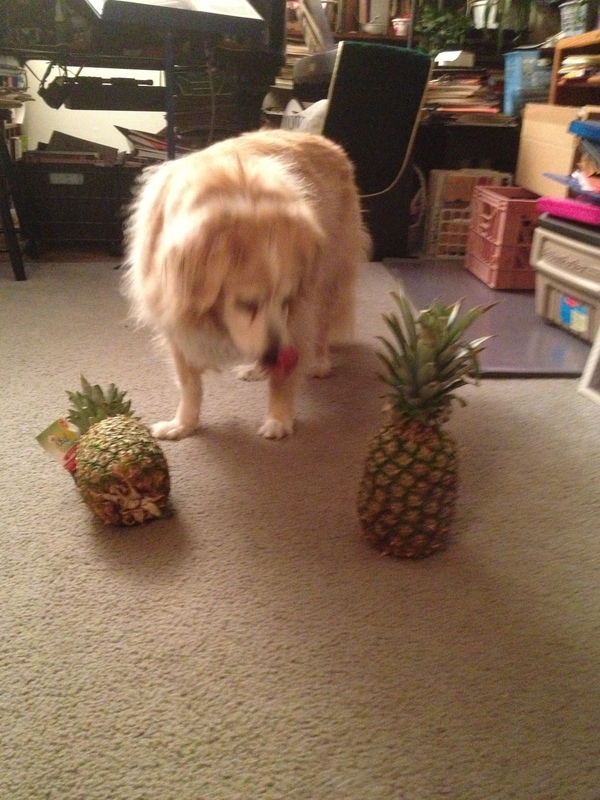 We’ve only had one of the East Side boxes so far, but the dog was very interested in the pineapple they brought us along with all kinds of wonderful things. She even looks like she’s licking her lips! With all these fruits and veggies coming into the house, we’ve started eating more healthfully. This is one of our newer recipes when I have the time to heat up the oven. 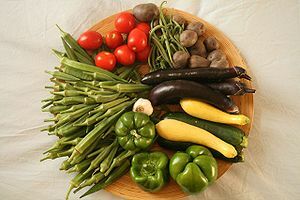 Oven roasting concentrates the flavors of the vegetables resulting in a flavorful side dish that’s still low in sodium. Toss vegetables with oil in large bowl. 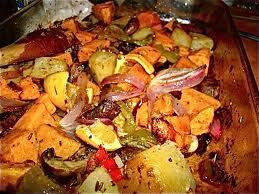 Sprinkle seasonings over vegetables; toss to coat. Spread vegetables in single layer on foil-lined 15x10x1-inch baking pan. I’ve been making this for years, even before the heart attack, mostly because I’m too cheap to buy pre-made vegetable broth. I also do something similar with chicken. I save all my vegetable scraps such as carrot peelings, celery ends, onion skins, garlic skins and ends, bell pepper scraps, ends from trimming cabbage, trimmings from tomatoes, broccoli stalks. Belonging to a CSA farm, we get lots of veggies during the summer. I put all the peelings in a Ziplock Freezer 1 gallon bag and save them in the freezer, and keep adding to the big bag until it’s full. 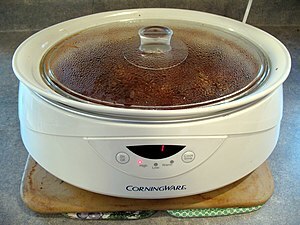 When I’ve gathered a couple of full bags, I take them out and dump them in the crock pot and fill with water (about 6 quarts), cover and set on LOW for overnight. Allow to cool completely and ladle into a colander in it with a big bowl under it. Discard all the scraps in the colander. Package up the broth into quart-sized Ziplock freezer bags, 2 cups per bag, canning jars or other freezable containers. You can also freeze some of the broth in an ice cube tray. Pop out the cubes and put in a freezer bag, labeled and dated. Use these when a recipe calls for 1 to 2 Tbsp. of stock or broth. To use this with chicken – I do all of the above and save chicken bones and parts in a separate freezer bag, When it’s time for the crockpot, I add the chicken to the veggies and cook overnight. Strain well! Preheat broth over medium heat. pound chicken breasts to 1/4 inch think. Mex cornmeal and pepper on a plate and dip chicken in it. Heat oil in large nonstick skillet over medium-high heat add chicken and cook for 4 minutes on each side until brown. Remove from pan and keep warm. Add lemon juice and hot chicken broth to skillet, scraping the pan. Reduce heat to medium, stir in butter. Return chicken to skillet and cook for 3 minutes until done. Serve immediately. Heat oil in large nonstick skillet over medium-high heat add lime juice, Mrs. Dash and chicken broth to skillet, scraping the pan. Add chicken and cook for 4 minutes on each side until brown. Reduce heat to medium, stir in butter.